Personal Planner Giveaway and Discount! I’m not sure I can get away with starting another New Year without sharing another Personal Planner giveaway and discount code here on my blog! 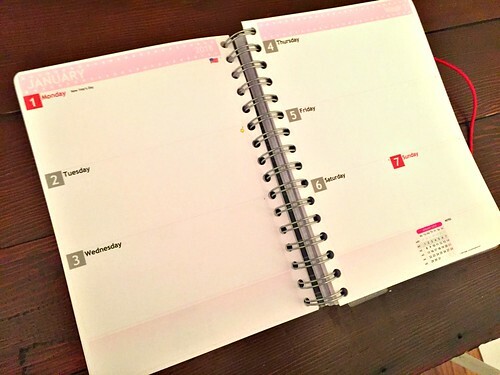 As many of the long-time readers know, I have faithfully used my Personal Planner for the past 5+ years — even after adding 4 kids into the mix! I suppose this is a testament to how flexible the Personal Planner is — with so many great customizable features, I can mix, match, change, tweak, and tailor this planner to fit MY needs year after year. It’s so fun and bright… it’s just begging me to be productive! I generally use the same layout and personalized options each year, but this year, I decided to switch up the weekly page layouts. I’m trying horizontal daily columns instead of vertical columns as I feel it might work better for the types of lists and to-dos I have now. If I hate it, I’ll go back to vertical next year again — but so far, it seems to be working well for me! If you’d like to know exactly how I personalize my planner up, you can read those details towards the bottom of this post. 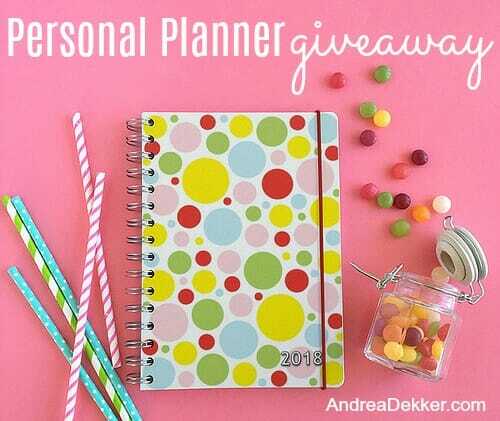 If you’d like to give the Personal Planner a try, take a few seconds to enter the giveaway below! 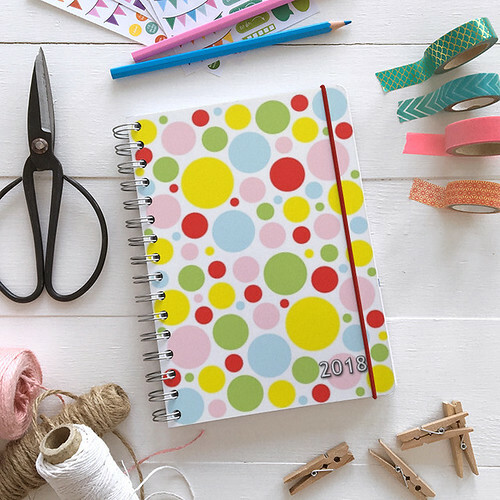 Today, ONE lucky reader will win a Personal Planner voucher for a planner of your choice! Also, all Andrea Dekker readers will get 15% off using code: A-DEKK-ER15 from now through January 10, 2018. 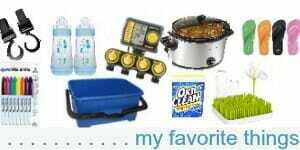 To enter, simply use the Rafflecopter widget below (it might take a second to load). This giveaway ends at 11:59 pm EST, Monday, 01/08/2018 and is open to ANYONE, 18 years or older. The winners will be randomly selected via Rafflecopter and notified via email. I received a duplicate prize package in exchange for hosting this giveaway — but all opinions are 100% my own. Please see my full disclosure policy and contact me with any questions you have. Good luck! hmmmm… I wouldn’t think it would take that long (especially now that their busy season is over). Did you contact them yet? If not, send me your order information and I’ll contact them. Thank you, Andrea!! I just ordered this and used your code. Today is the 11th but they still approved it. This is the first personalized planner I have ordered and I am excited about it. I may switch to starting in July sometime since I am a teacher and my kids are all in school. Still, there’s something exciting about a new year beginning and starting a new planner. oh good — glad you were able to get the discount! 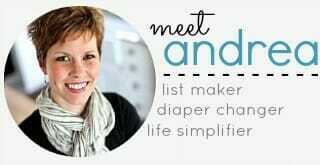 Hi Andrea!- I became hooked on the personal planner when you introduced it years ago. I also switched to the horizontal layout just this year (I start my new ones in July= “school brain”). I have found that inserting my own line down the center of each page and listing my to-do list on the left side of each day and any commitments we have on the right side, works well for me. I think I like it better than the vertical! I am curious about how you like this layout. Please keep us updated! oh my word –this is EXACTLY what I’m doing now too! To-dos on the left, commitments, meetings, or anything “extra” on the right. It’s working really well so far (only a couple weeks in though). I like that I have more horizontal room to write my to-do list… and then if I don’t finish something that day, it just stays “uncrossed off” and becomes part of the next day’s list. So, Monday-Wednesday, I never re-write items, I just keep them all on the left side of the page and continue working my way down. Then I do the same for Thursday-Saturday. I really like it so far! I used to start my new planners in October (not really sure why) but Dave always starts his in August because of the school year. I have a feeling I might switch to July or August too once more kids are in school! 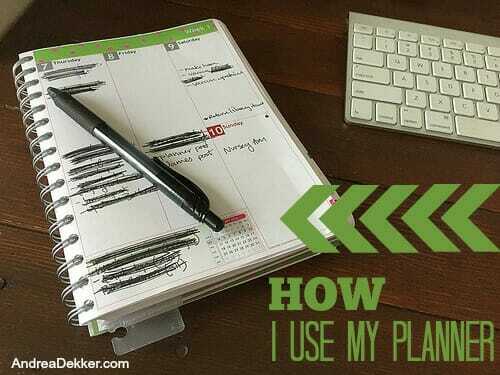 So glad you love your Personal Planner!! Thank you for the giveaway, Andrea!! I have the same dilemma Alicia! I do not know whether to focus on the planner or the wall calendar. I put everything for our entire family in my planner and Dave puts his school related things in his own planner. 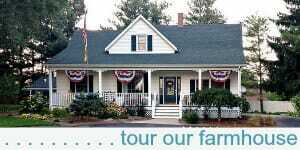 We regularly go over our schedules (especially evening schedules) so we know what’s coming up. This is just what works for US for NOW… it all might change in a few years once the kids are older! I love planners! I’m on a mission to find the perfect planner each year starting around November. I was running behind on finding one this year and when I opened up my stocking to find one as a present from my 19 year old son I was a little nervous because I was worried it wouldn’t be something that worked for me but he actually did a fantastic job and I think it’s going to work out fine. It was a proud mom moment. awww…. so sweet! What a great gift! 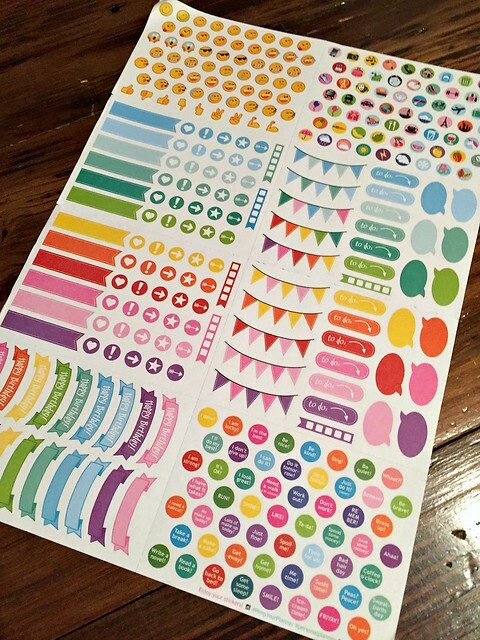 Do you use any of the stickers? And for what, if you do? They mostly look like decoration. I let the kids use them 🙂 They are very cute, but I don’t really do stickers! 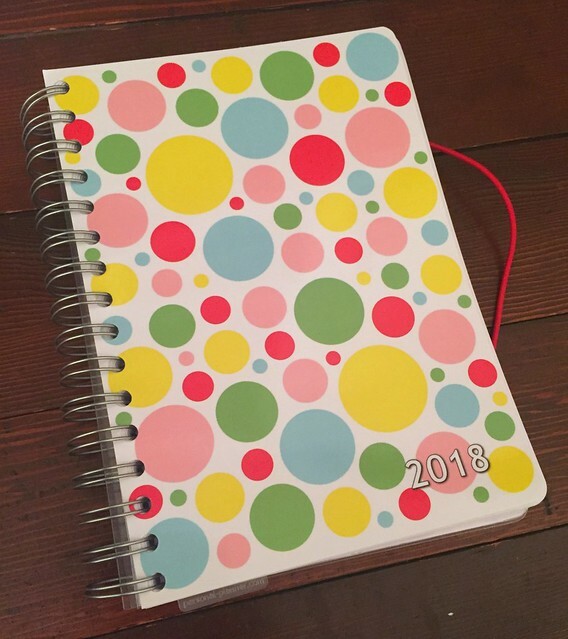 I ordered this planner for the 3rd year in a row…I LOVE it!! This year I had our family photo be the cover page…that way I can remember not only what I need to do… but WHY I need to do it!! 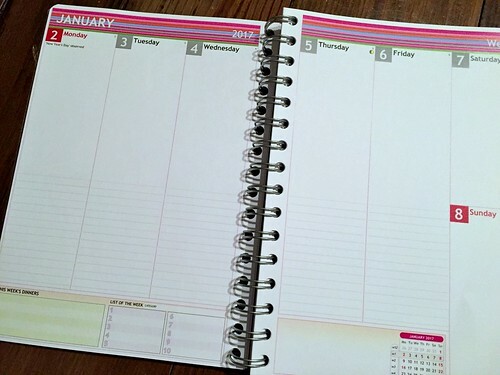 These are great planners and they hold up so well!